Colorado is home to some of the largest elk populations in the world and Moffat County boasts to two of the largest migratory elk herds in North America as well as being a hunting hot spot for deer, antelope and small game. Each year Colorado sees more than 375,000 deer, elk and pronghorn hunters. Biologists put Colorado’s elk population at more than 280,000. The state’s deer herds are estimated at more than 466,000. With nearly 2 million acres of public land, the nation's only over-the-counter bull tags, and a call center staffed with live human beings who actually hunt, Colorado is bending sideways to get you to our elk. 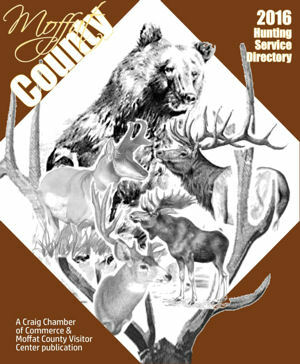 Click here to request free hunting information from the Craig Chamber of Commerce & Moffat County Visitor Center. We'll send everything you need to plan your Northwest Colorado hunt. Our Sportsman Information Center is here to help you obtain the lastest information relevant to your outdoor needs. Call 970-824-3046 or 1-800-864-4405. Lost your card and need a replacement? If you lost your Colorado Hunter Education Card, we may be able to replace it. If the card is verified to your Colorado CID record you can purchase a replacement online. Replacement cards may be purchased from the CPW Licensing website for $5. The replacement will be a blue card printed on the same paper as Colorado hunting/fishing license. Click the image above to order Hunting, BLM or Forest Service maps online. The Craig Chamber of Commerce’s mission is to build a strong economic environment that contributes to business and community success. ©2019 Craig Chamber of Commerce. All Rights Reserved.